Freedom of speech and freedom of information in Somalia are under serious danger. Said Tahlil Ahmed, director of the independent HornAfrika Radio was brutally killed with a shot to the head in Mogadishu last 4 February. His name is already the second in the list of journalists who have been murdered in 2009. The reporter is only the last victim of a long series of assassinations, harassments, attacks and kidnappings that have been occurring in the country for the last couple of years. This condition of fear frequently undermines the capacity to provide information, since many journalists choose to work in secret and, sometimes, to give up their jobs altogether. Such a scenario has been worsening since the beginning of 2006, and the figures by the National Union of Somali Journalists (NUSOJ) in its annual reports for 2007 and 2008 entitled “Somalia: A precarious and perilous place for the press”, are impressive. 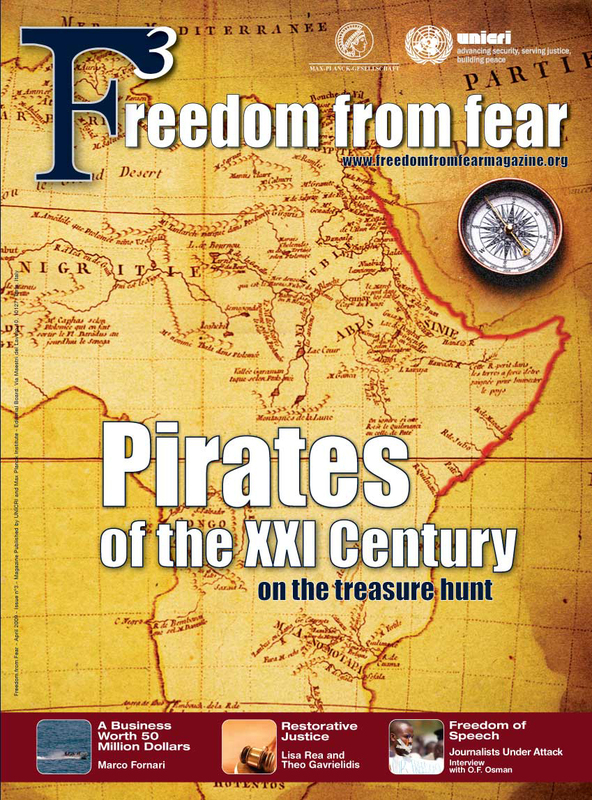 Freedom From Fear has interviewed Omar Faruk, Secretary General of the National Union of Somali Journalists (NUSOJ), to talk about the current condition of the media in the Somali region and to explore the need of pirates to gain media coverage. Q: Mr. Osman, in the last three years many journalists and media professionals have been at risk, and some of them died. What are the main figures of this discrimination according to the NUSOJ report? A: 2007 was the annus horribilis for media workers in Somalia and the figures are impressive: 9 media professionals were killed; 4 were wounded; 53 were arrested; and some 60 journalists fled the country to escape the tragedy of this persecution. 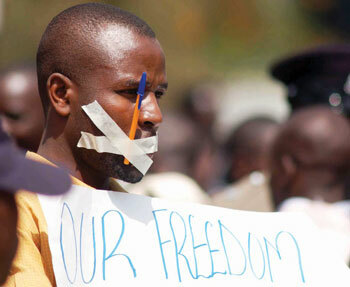 According to the same source, the violations of press freedom have increased by 85% from 2006 to 2007. Last year, two journalists were killed (one of them was blown up with a remote controlled bomb), and two more were arrested; however, despite the numbers have diminished, general work conditions were still deprived of the fundamental human rights and labour rights. Q: As a journalist, what is the most dangerous area in the country to operate in? A: The worst area to operate as media personnel is the Somaliland, in the south of the country. The two victims of 2009 were murdered in Kismayo, in south Somalia, a city that is particularly affected by intimidations to journalists. One of the two was the then vice president of the Journalist trade union, NUSOJ, Nasteh Dahir, who worked for both the BBC and Associated Press news agency; he was very active in denouncing the intimidations and was shot in the chest and stomach just outside his home. Q: Besides the discrimination and the harassment, what are other consequences of such a condition? A: The sense of fear in which the media lives has provoked another trend. As a result of this campaign of intimidation, several incidents happening to media workers go unreported. Journalists have become a persona non grata and for most of them the only possible solution is fleeing away from the country. Q: What can be openly told and, diversely, what are the sensitive matters? What is the climate in the relations between journalists and the government? A: Publishing or broadcasting any news that matters is a problem. Political news, or any news critical to warring factions in Somalia, may cost the journalist’s life or lead to shutting down the media house. The relationship between the officials of the transitional federal government and the journalists seem to be improving since the expansion of the parliament and the election of President Sheik Sharif Sheik Ahmed. The previous leadership in the government had terrible relationships with news media. Q: How far could a wider coverage help and support the national building process? And by whom do you feel bolstered as a category? A: As you know, Somalis have been killing each other for the last 20 years. The country seems divided into blocks by warlords or regional administrations. Some people have taken to each other extreme hostilities. The media is the main channel that can help facilitate dialogue and boost the national reconciliation process, which is the only chance to achieve lasting peace and to rebuild the nation. Somali journalists get support from the ordinary people who feel that they are providing news and information in a dangerous situation. We also get political, moral and financial support from the international community of international press freedom advocacy groups, human rights organisations and donor agencies. Q: What kind of support do you miss most? A: As you can see the whole system of the country is fragmented. The three key institutions of any country, the Executive, Legislative and Judiciary branches, are either too weak or non-existent. The media needs protection from the national government, and this is what we are missing. Q: Is piracy an issue covered and discussed by the media in Somalia? Do the pirates want to avoid such an exposition? A: It is the opposite. The pirates themselves contact the media, while the media sometimes looks for the pirates. The pirates want media attention and they want to get it through the local media. If the media does not report things, as they want, then the media faces problems of pirates who could endanger the journalists’ lives. Q: How do people and society piracy as a phenomenon? And how is it seen by those who are involved in it? A: Most of the public sees this problem of insecurity in Somalia’s waters and in international seas as one that they have been enduring for the last 18 years. There have been kidnappings for ransom and there have been robberies, but people believe that they have finished with that business and have turned to the ocean where pirates think that they can get more money immediately and easily. Somali people believe that until this problem of insecurity on the ground is resolved, pirates are unlikely stop. Q: What has been changing with the new elected government? A: The current new government has been concentrating on reconciling people following different religious leaders, intellectuals and clan elders, and it has been focusing on restoring peace through dialogue. At the moment, Mogadishu seems to be improving in terms of security. Nicola Filizola is Media Consultant at UNICRI.